How much does a Black Rok kitchen cost? It might not surprise you that we don’t have set price lists. Like our clients, all Black Rok kitchens are unique. We don’t sell kitchens by the box. Nevertheless, we appreciate that — like most of our clients — you’d probably like an idea of the price of a Black Rok kitchen. Over the years, the kitchens we have supplied have ranged in value from £12000 to £60000 and above. Regardless of cost of your new kitchen, one thing remains constant — value. When you come in and discuss your needs, we’ll ensure your budget is used as efficiently as possible. We appreciate that a new kitchen is a very significant investment and like any investment the figures must make sense and be justifiable. This is just as important to the £12000 kitchen as it is to one costing four times the price. What does the extra money buy? Unsurprisingly, the size of the kitchen and quantity of furniture affects the price, and larger usually equates to more expensive. Higher specification and more appliances increase cost and so too does the use of more expensive materials. But there is plenty of scope to adjust the overall cost of your kitchen depending on your own priorities. Perhaps you’d like to spend more on lighting, or more on convenience features such as extra appliances. 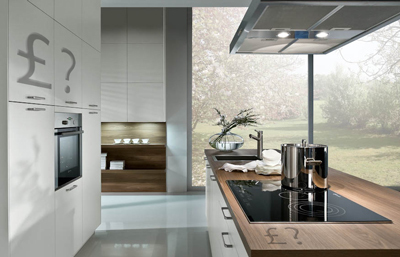 The choice of worktops also provide opportunities to adjust the cost of your kitchen. Some of our clients allocate as much as 25% of their budget to the worktops whilst others would rather spend more money elsewhere, maybe on convenience features such as wine coolers or coffee machines. Before we begin to design and build your dream kitchen we need to have a rough idea of your budget, we can then help you to work within those figures so that your kitchen will be everything you dreamt it could be. If you are not yet sure that there is a Black Rok kitchen for you, then come in, have a chat and discover how flexible and accommodating we are, you might get a pleasant surprise.